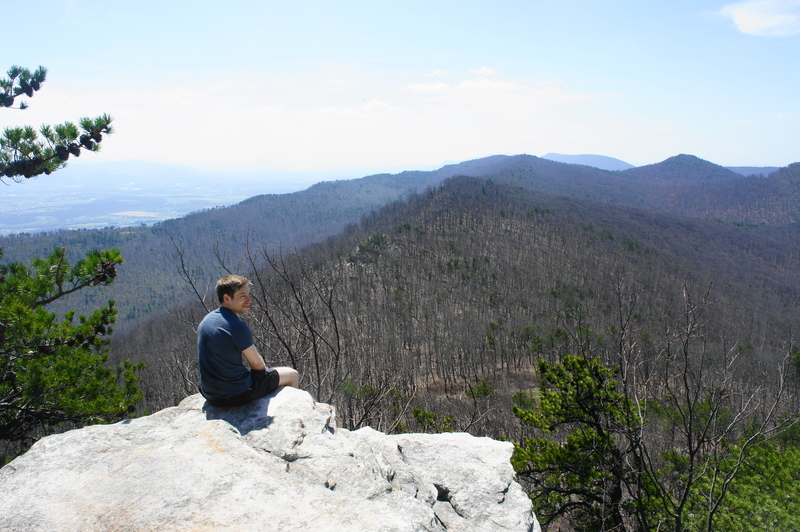 This excellent hike combines two of the finest summits in northern Virginia in a strenuous circuit with considerable elevation gain and loss. 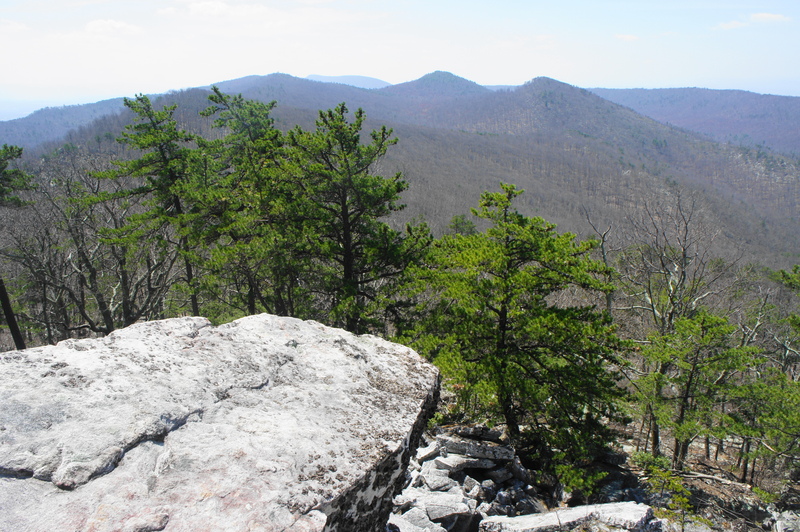 The trek up Duncan and Strickler Knobs is not for the casual hiker; it involves significant climbs and drops, including a borderline Class II/III rock scramble to the summit of Duncan and a seemingly endless detour to the top of Strickler. 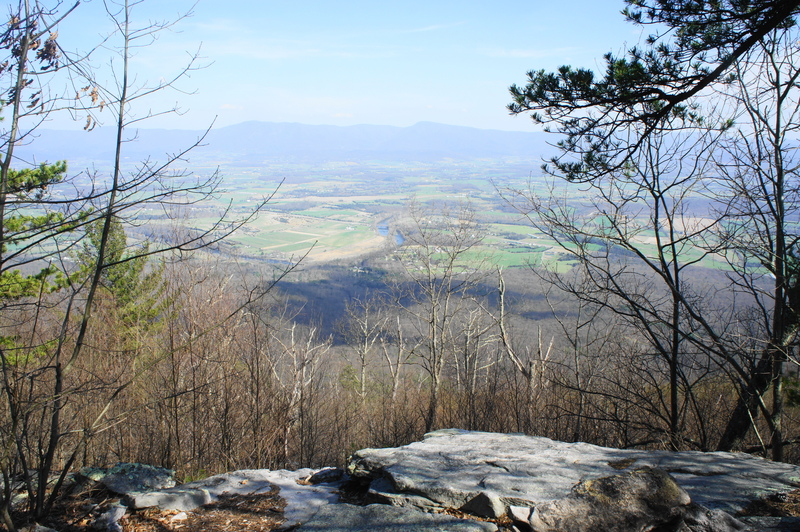 Visitors, however, are rewarded with world-class views of the Massanutten Mountain area, Shenandoah Valley, and the surrounding mountain ranges of northern Virginia. Plan to spend most of the day hiking this loop and enjoying the vistas. 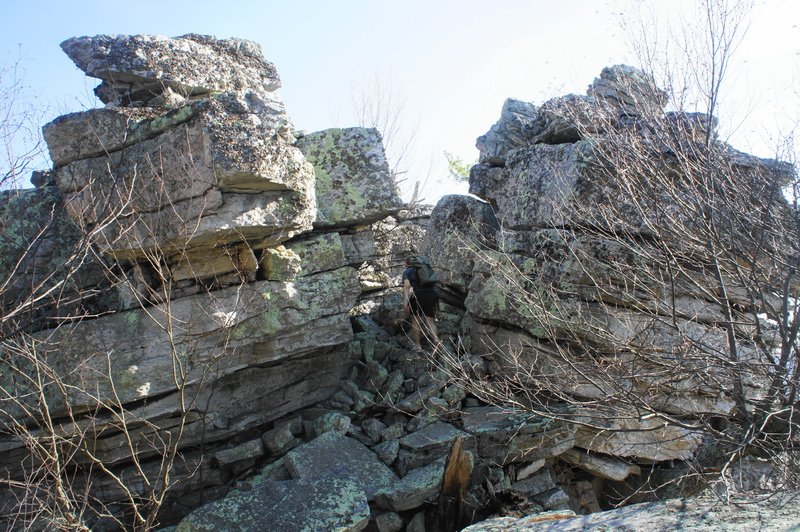 There are multiple points of approach to reach Duncan and Strickler Knobs in the heart of the Massanutten Range. This description assumes a start and end at Gap Creek Trailhead, situated roughly 2.5 miles southwest down the unpaved Crisman Hollow Road from its intersection the paved Camp Roosevelt Road. (Note: This is roughly a 2 to 2.5-hour drive from Washington, DC and 2.5 to 3 hours from Richmond, VA.) There is a small parking area on the south side of the road; blue blazes direct hikers to walk down a short side track with some additional parking. After 100 yards, the track reaches a small campsite, and the Gap Creek Trail bears off to the left, dropping into the woods and crossing a bridge over Passage Creek, which carved the valley in which you now stand. This is the last bit of solace before a relentless uphill that will last more than 1 ½ miles. The ascent begins with a gradual incline, making gentle curves and bends up the slopes of Catback Mountain. Initially rocky, the trail smooths out as it climbs a series of switchbacks. 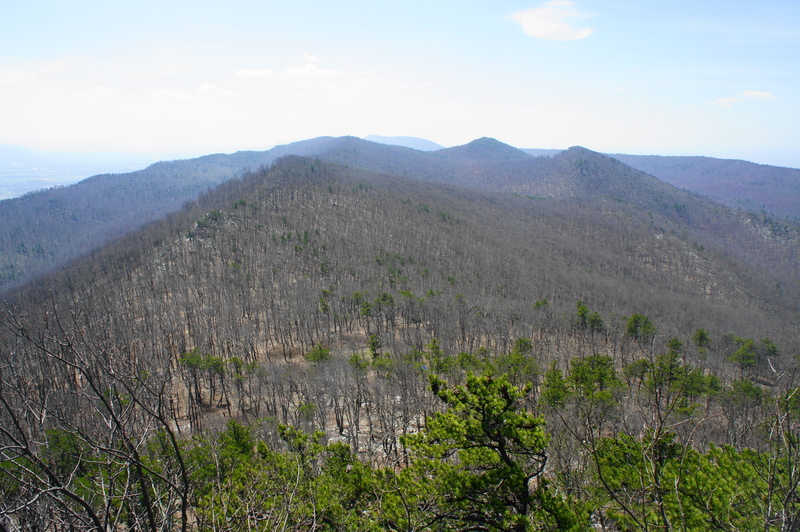 At ¾ mile, the path rounds a left-hand bend with some obscured views of Crisman Hollow and an unnamed knob to the southwest. From here the trail ascends a gently rolling ridgeline and then gradually bends right again, leading to a welcome flat section at around 1.1 miles. By now you have covered roughly 650 feet in elevation gain. Hikers will reach the first trail junction at 1.2 miles, where the yellow-blazed Scothorn Gap Trail comes in from the right. Stay left on the blue-blazed Gap Creek Trail, which immediately resumes its ascent again, hugging the lower slopes of Duncan Knob. 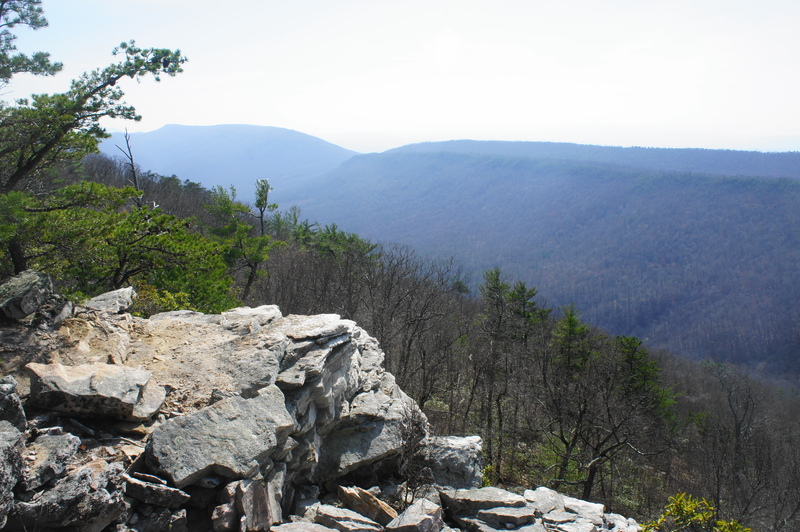 At 1.5 miles, the trail crests the ridge at Peach Orchard Gap, situated at roughly 2,500 feet (850 feet above the trailhead). Here the path splits. To visit Duncan Knob first, bear left on the white-blazed spur. From here it is a short but steep ¼ mile to the summit; this section covers includes around 300 feet in elevation gain. At first the ascent is gradual, passing a nice campsite on the right. 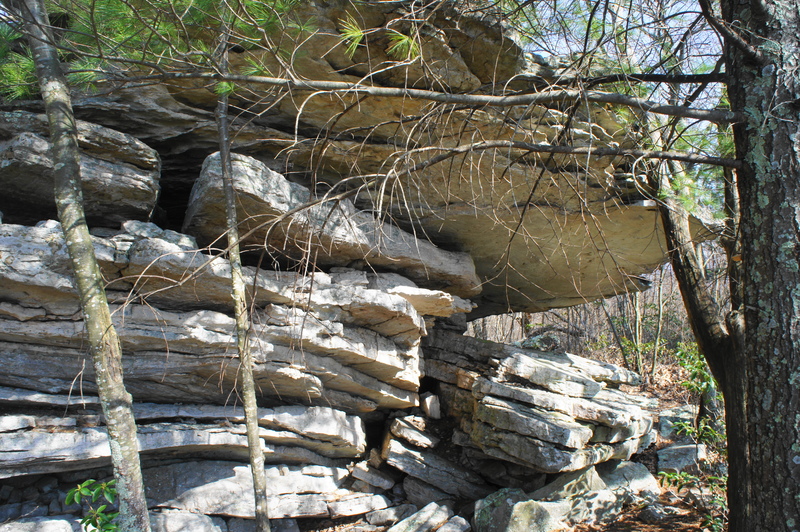 At about 1.65, however, the woods suddenly give away to a rocky jumble and massive sandstone talus slope. The summit is now visible atop a jagged rock wall. As you climb, fantastic views open up in several directions. 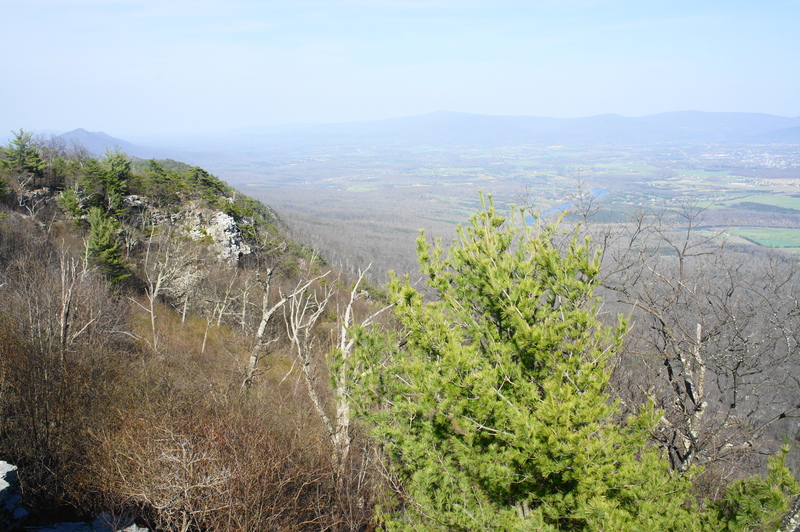 To the west, Crisman Hollow is flanked by lengthy Kerns Mountain (2,569’), with Short Mountain (2,600’) and the Shenandoah Valley beyond. Curving east as you approach the top, the primary viewpoint atop Duncan Knob (2,803’) offers an obstructed view south: Massanutten Mountain, Middle Mountain, and Waterfall Mountain converge at a series of peaks, most of which are unnamed. (Note: The far western tip of this cluster includes Strickler Knob (2,780’), the second primary destination of this hike.) On the horizon is Big Mountain (2,962’), which is topped by a radio tower. Many hikers turn around here and return to the trailhead, making for a nice 3.5-mile half-day hike. Curious hikers with additional energy, however, can continue onward to Strickler Knob, completing a nearly 10-mile stem-and-loop that will take most of a day. 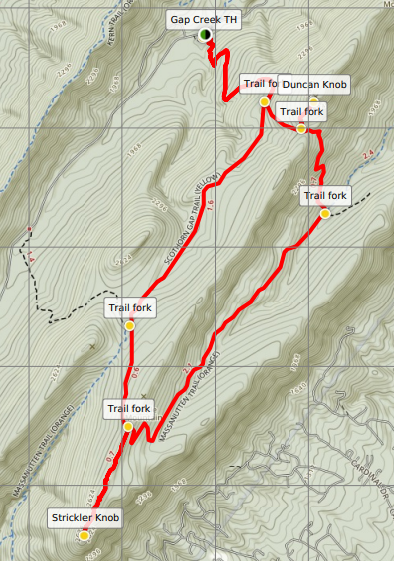 To pursue this route, retrace your steps down Duncan Knob and back to Peach Orchard Gap. This time bear left on the blue-blazed Gap Creek Trail as it descends the eastern slopes of Catback Mountain in the shadow of Duncan Knob. Very quickly, hikers will shed much of the elevation they had gained earlier, dropping about 600 feet into Duncan Hollow, a relatively wide and woody valley. The descent ends at a trail junction at about 2.75 miles, where the Gap Creek Trail intersects with the lengthy Massanutten Mountain Trail, a 71-mile loop that traverses much of the Massanutten Range. With the sounds of the main Duncan Hollow stream ahead, bear right on the Massanutten Mountain Trail as it begins a long and slow ascent to Strickler Knob. Keeping its distance from the creek, the orange-blazed path bears southwest in and out of occasional patches of mountain laurel, flattening out a bit at around 3.2 miles before resuming a steady climb. Much of the tree growth in this area is relatively new, and one can spot patches of old growth that were lost to a relatively recent forest fire. As a result, much of this climb is in nearly full sun, making for a tough slog on a hot day. 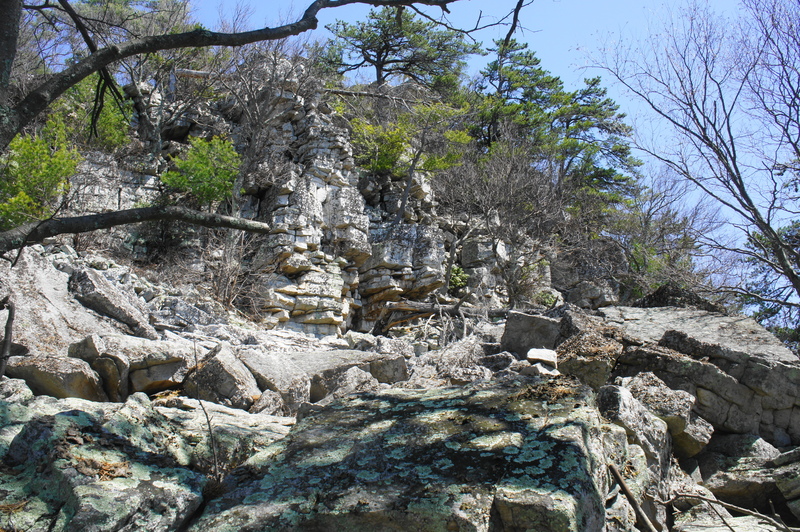 At around 4.5 miles, the trail ascends a set of switchbacks, surrounded by increasingly rocky terrain. Upon cresting the ridge of Middle Mountain at 4.9 miles, look for a trail marked with pink blazes that bears off to the left. This is the start of a ¾-mile spur to Strickler Knob, which is unmaintained and overgrown but marked and relatively easily to follow. 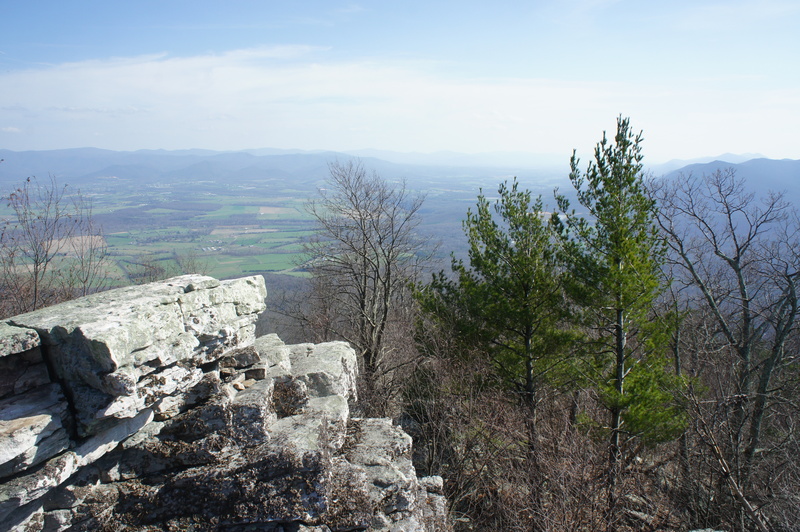 The spur involves little elevation gain or loss but a whole lot of rocky traverses as the trail follows a sandstone ridgeline out to the knob. The winding path passes a series of false summits and rock outcrops, finally reaching the first views at about 5.5 miles. Here a rock outcrop overlooks a tree-lined valley, with neatly parallel Waterfall Mountain beyond. 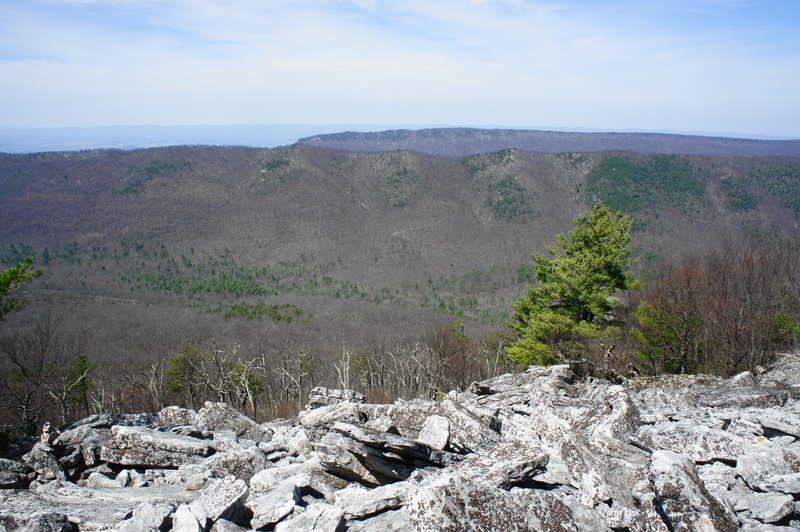 The mountains of West Virginia dot the horizon to the west, while Big Mountain dominates the landscape to the south. This lovely view is only a preview of what’s to come, however, and the trail continues across the ridgeline to the east-facing side at about 5.6 miles. Here a fine campsite, complete with a fire pit, overlooks the Shenandoah Valley, with the Shenandoah River neatly framed by the gap in the trees. This is another outstanding vista, but it’s again only a small flavor of the finale. Past the campsite, the pink blazes lead up and over a 4- to 5-foot climb that requires the use of hand holds to surmount. 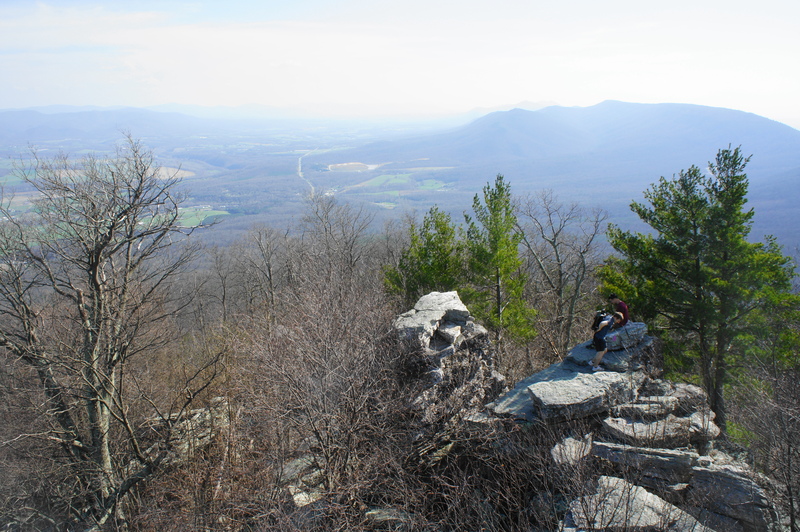 The final stretch involves traversing a rocky passage between two high stacks of blocky sandstone; at last, the lengthy spur ends at the final overlook, a stunning panoramic view of the Shenandoah Valley and Massanutten Range. The knob was named for Abraham Strickler, an 18th-century pioneer who established a settlement in the area in around 1730. Backtrack a few steps and scramble to the top of the sandstone outcrops for the best vantage point. 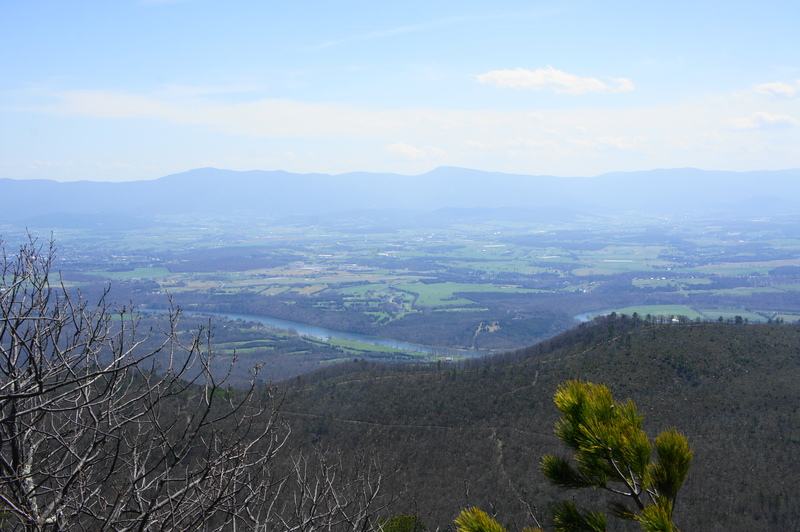 In addition to the views over Big Run to Waterfall Mountain to the west, the break in the mountains to the southwest at New Market Gap gives way to an obstructed view of Big Mountain, marking the continuation of the Massanutten Range. Highway 340 stretches down the Shenandoah Valley to the south, while the Blue Ridge Mountains of Shenandoah remain in view to the east. It’s hard to find a finer view on Massanutten Mountain, and Strickler Knob probably belongs in a discussion of the best vistas in the state of Virginia. 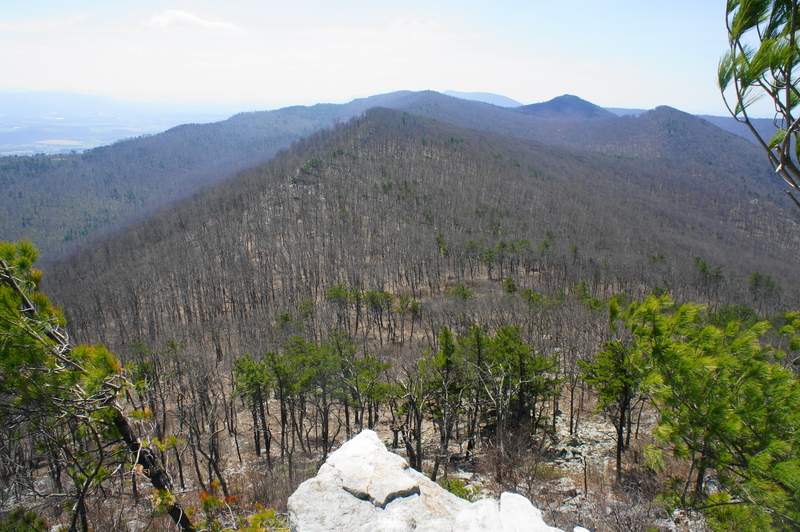 It’s hard to say goodbye to the excellent views at Strickler Knob, but when you’re ready, return the way you came on the pink-blazed spur, arriving back at the main, orange-blazed Massanutten Mountain Trail at 6.4 miles. Bear left, following as the trail gradually descends the slopes of Middle Mountain, en route to Scothorn Gap. Hikers—now probably weary and ready to return home—will arrive at a four-way junction at about the 7-mile mark. Take a right, leaving the Massanutten Mountain Trail in favor of the Scothorn Gap Trail, which proceeds to pass through its namesake gully. The path stays to the right of a minor stream that appears beyond the gap and drops gently as it heads northeast to reconnect with the original Gap Creek Trail. Bear left at the fork at 8.6 miles, returning to familiar territory for the final 1.2-mile descent to the Gap Creek Trailhead. 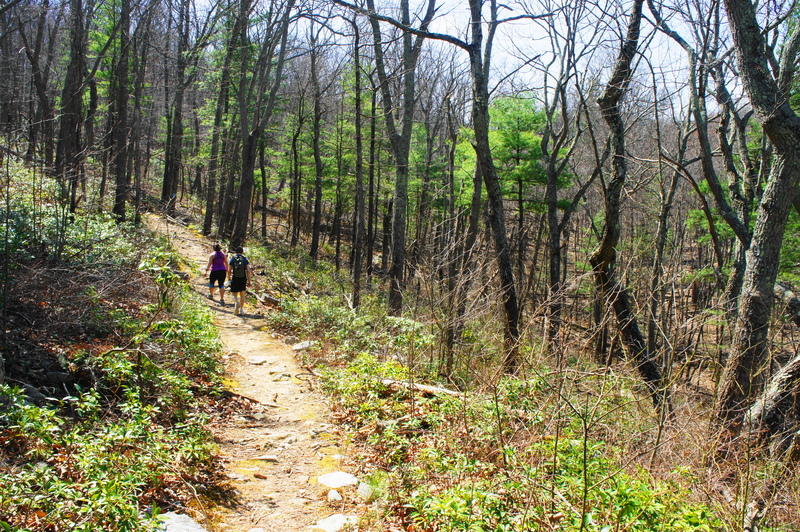 Bending and weaving down the slopes of Catback Mountain, hikers will return to the parking area, completing nearly 10 miles of ups-and-downs—with visits to two of the best lookouts in northern Virginia. Allot most of the day for this hike, and pack plenty of water to prepare for the strenuous climbs and arduous rocky traverses. 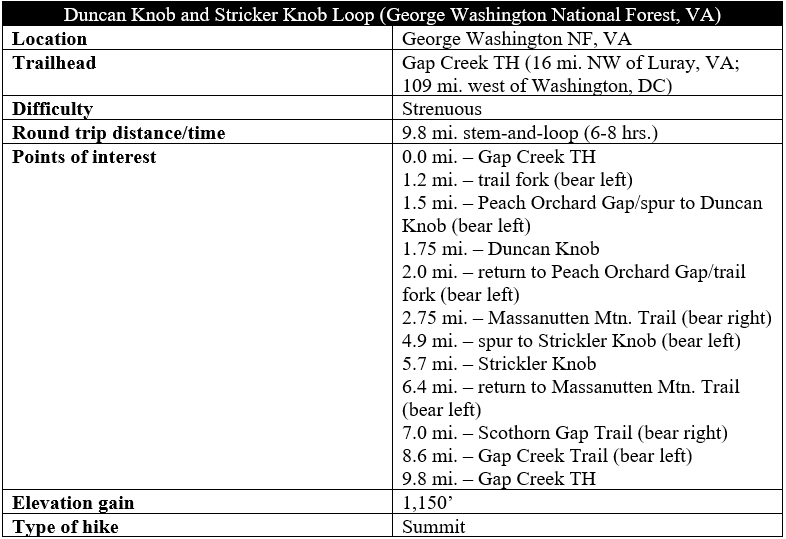 This entry was posted in George Washington National Forest, Strenuous Hikes, Virginia and tagged Catback Mountain, Duncan Hollow, Duncan Knob, Gap Creek Trail, George Washington National Forest, Massanutten Mountain, Massanutten Trail, Peach Orchard Gap, Scothorn Gap Trail, Strickler Knob, Virginia, Waterfall Mountain. Bookmark the permalink.